Viral hepatitis affects millions of people in the United States. The most common types of viral hepatitis in the U.S. are hepatitis A, hepatitis B, and hepatitis C. When a person first gets viral hepatitis, he or she will develop an acute, or short term, infection which can be a very mild illness with few or no symptoms or a more serious illness lasting months. While hepatitis A can only be an acute infection, hepatitis B and hepatitis C can develop into chronic, or lifelong, infections. 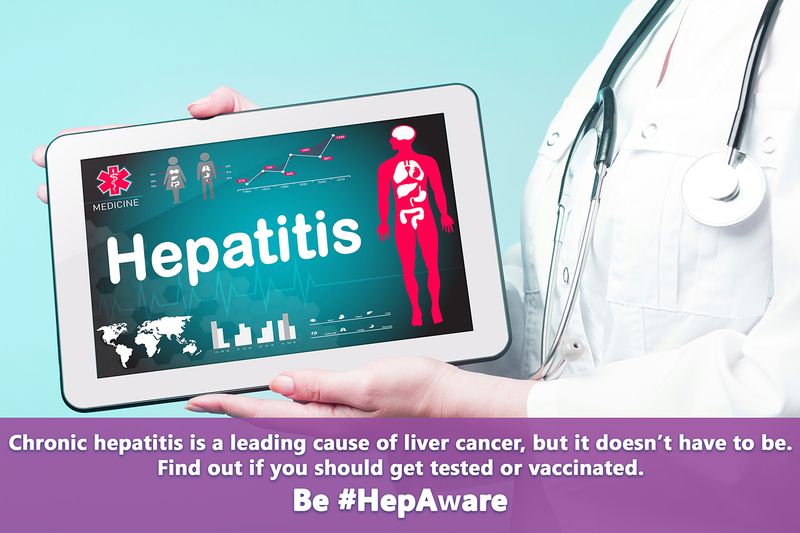 If left untreated, chronic hepatitis can cause life-threatening health problems such as liver damage, cirrhosis, liver failure, liver cancer, and even death. Most people with chronic hepatitis are unaware of their infection because people can live with these diseases for decades without having symptoms or feeling sick. May has been designated as Hepatitis Awareness Month and May 19th as Hepatitis Testing Day. The Centers for Disease Control and Prevention’s Division of Viral Hepatitis (DVH) uses these observances as a time to work with prevention partners and healthcare providers to educate populations at-risk and the general public about hepatitis, encourage screening and testing, and promote vaccination and prevention strategies. How Can Partners Raise Awareness? Raise awareness among the millions of Americans who have viral hepatitis and do not know they have it by participating in CDC’s DVH Thunderclap on May 19th – an easy way to share and amplify the Be #HepAware message across social media. approximately 75% of people with hepatitis C are “baby boomers” or those born from 1945-1965? 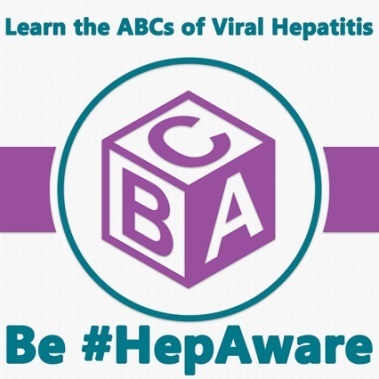 Discover more about the ABC’s of Hepatitis, including key facts, transmission modes, recommended screenings and vaccinations, common symptoms, and treatment options. How Can Partners Promote Hepatitis Testing? The online Hepatitis Risk Assessment that asks the user questions based on CDC’s guidelines for testing and vaccination. The Hepatitis Risk Assessment allows individuals to answer questions privately and print their recommendations to discuss with their doctor. An online and mobile testing locator that you can use to help your clients quickly locate a confidential, nearby, and free or low cost viral hepatitis testing facility. Digital promotion tools, PSA scripts, fact sheets, proclamations, posters, and other materials on the Hepatitis Awareness Month and Hepatitis Testing Day resources page. The Know More Hepatitis campaign, which aims to increase testing for hepatitis C among baby boomers or people born from1945-1965. Resources include fact sheets, posters, infographics, buttons and badges, live-read radio scripts, templates, and other images. The Know Hepatitis B campaign aims to increase testing for hepatitis B among Asian Americans and Pacific Islanders. This multilingual campaign has materials in English, Chinese, Korean, and Vietnamese with select fact sheets also available in Burmese, Hmong, Khmer, and Lao. Campaign materials include videos, fact sheets, posters, infographics, customizable flyers, and other resources. NPIN understands this is an important and ongoing conversation for prevention partners across the country. We encourage you to join the NPIN Community to share your prevention activities, challenges, and best practices.